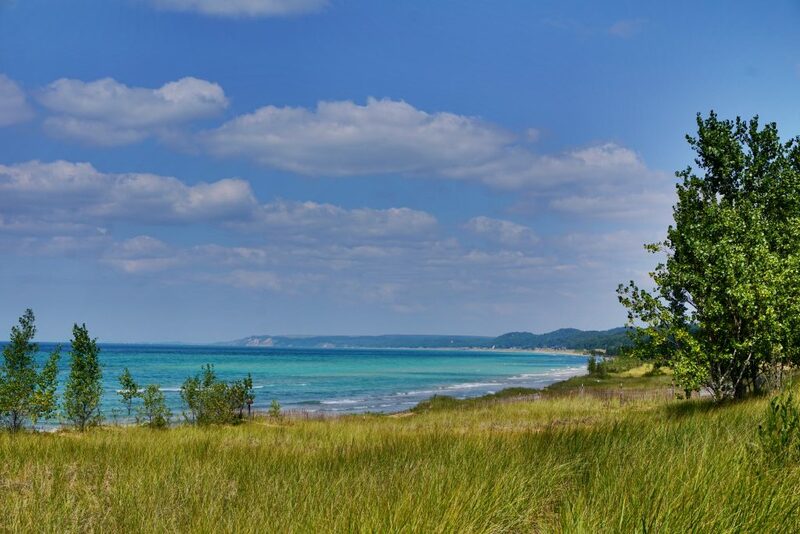 There are many scenic parks where you can camp along Lake Michigan. They don’t have luxurious full hookup sites with lots of amenities but the rates are cheaper than most waterfront resorts and they’ll put you just a short walk from the beach. With summer almost here, we rounded up fifteen state parks where you can park your RV and cool off by this gorgeous Great Lake. 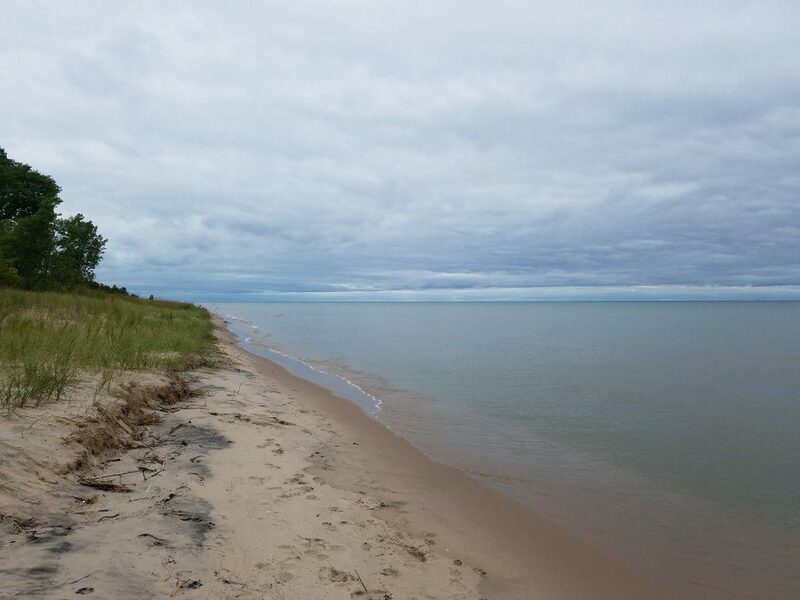 Hoffmaster State Park has three miles of Lake Michigan shoreline and a large wooded campground that gets plenty of shade. There are lots of great hikes across the park including the Dune Climb Stairway, which follows 193 steps up a large dune for sweeping views over the lake. The Gillette Sand Dune Visitor Center is also worth a visit to see exhibits about the history of the surrounding dunes. Orchard Beach State Park is a quiet bluff-top park that overlooks Lake Michigan. The campground has 166 sites as well as two shower buildings and a wooden stairway that leads down to the beach. A two-mile trail loops around the park and will give you beautiful views of the lake and spring wildflowers. Muskegon State Park stretches over two miles along Lake Michigan and a mile along Muskegon Lake. The park is over 1,000 acres large and has two campgrounds and over twelve miles of trails. You can hike through the dunes during the day and catch a vibrant sunset over the lake by night. Ludington State Park has miles of shoreline on both Lake Michigan and Hamlin Lake. 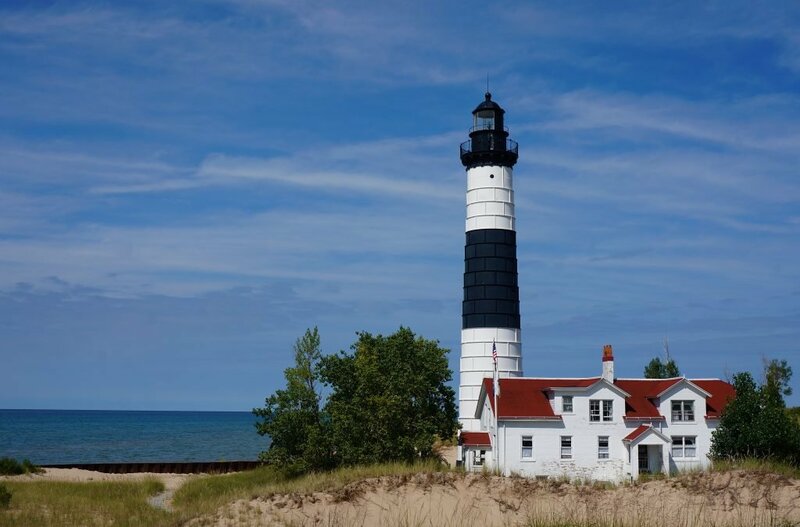 Big Sable Point Lighthouse is a main draw here and open daily from May through November. It costs $5 for adults and $2 for kids (12 and under) to climb the tower, and there is a gift shop and video room that are free to visit. There are also miles of hiking and biking trails as well as over 300 campsites. Grand Haven State Park is bordered by Lake Michigan and the mouth of the Grand River. It has a fishing pier and lighthouse as well as a boardwalk that follows along the river for a mile-and-a-half. The campground includes 174 sites that are paved and tightly spaced with 30/50-amp power hookups only. These sites are popular and often fully booked, so you’ll need to reserve your site in advance. Mears State Park is located along Lake Michigan in the small village of Pentwater. 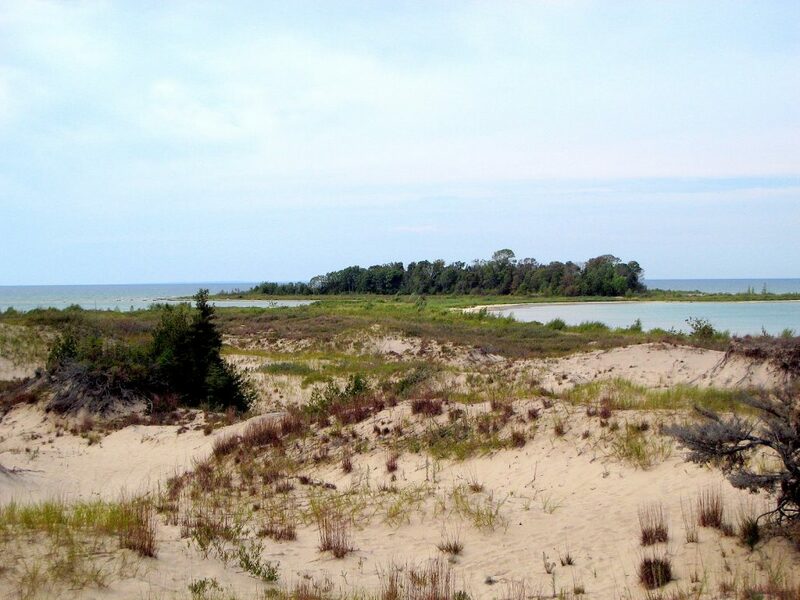 This lakeside park has campsites right on the beach and trails in the nearby dunes and woods. The shops and restaurants in town are also within walking distance. 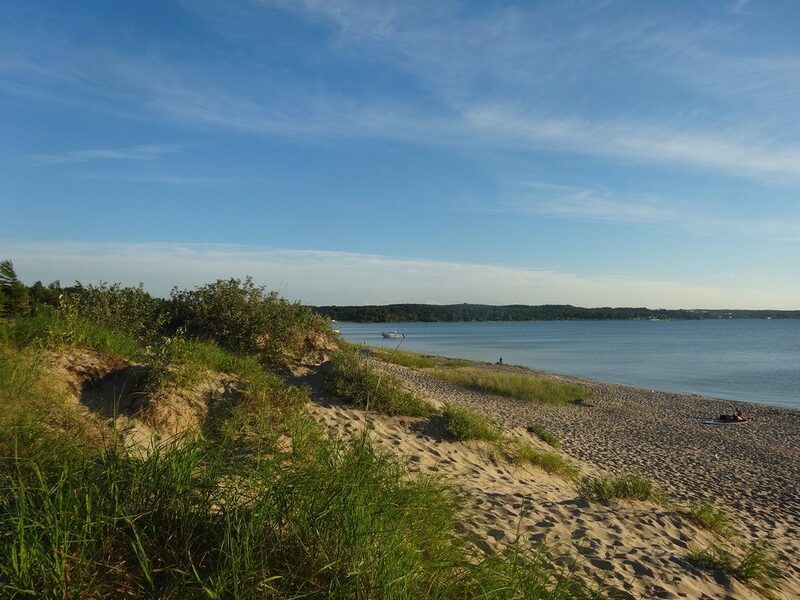 This state park has two campgrounds and a rarely crowded beach on the north end of Little Traverse Bay. There is a day-use area with picnic tables and grills as well as two hiking trails and a paved bicycle path that runs through the park. Wilderness State Park is in a secluded location at the northern tip of the Lower Peninsula. It’s a short drive to attractions in Mackinaw City and the Mackinac Bridge which connects to the Upper Peninsula. The campground is located in the woods along the lake and some sites have full hookups. You can find hiking trails across the park as well as a general store that sells amazing donuts, firewood, and miscellaneous items. Fisherman’s Island State Park is a lesser-known park on the Lower Peninsula. It spans for six miles along the lake and has nicely spaced rustic campsites surrounded by great views. There is a quiet, sandy beach to stroll and parts of the shoreline are perfect for rock hunting. 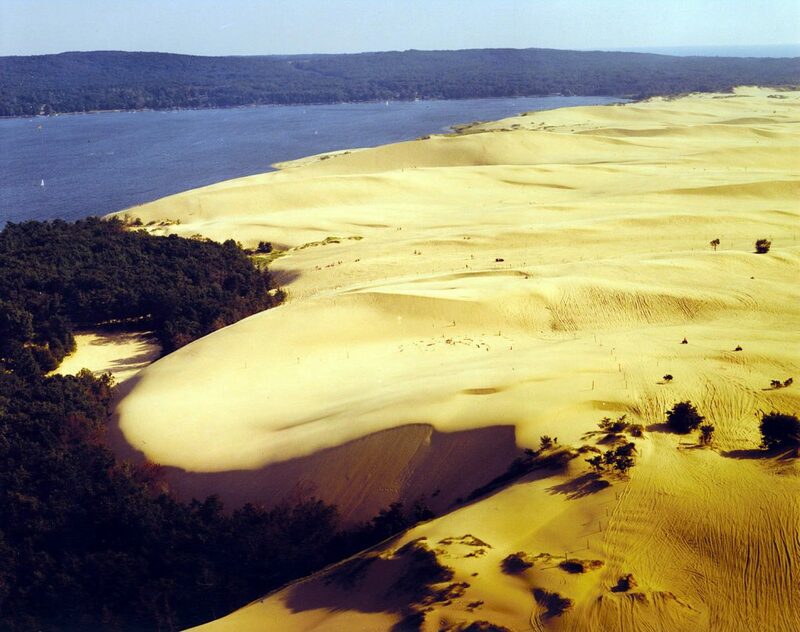 This park between Silver Lake and Lake Michigan has desert-like dunes and an area for off-road vehicles. The historic Little Sable Point Lighthouse is southwest of the lake and costs $5 to climb. The park also has a boat launch, picnic tables, and a large 237-site campground. 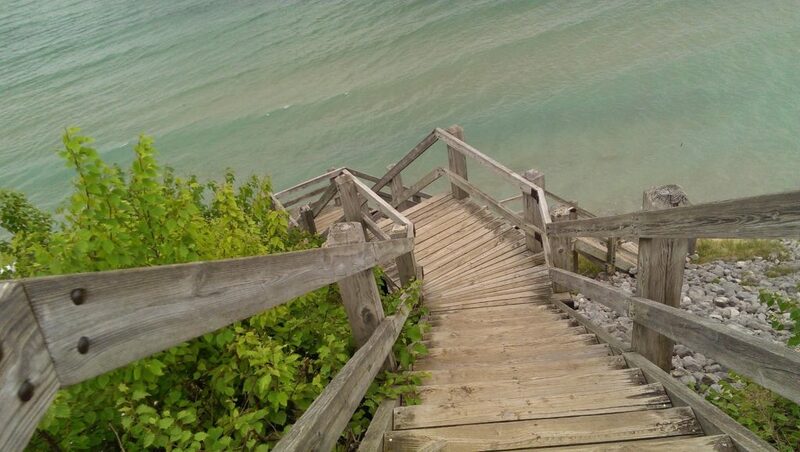 Harrington Beach State Park has scenic hiking trails and camping spots less than an hour north of Milwaukee. This Wisconsin park has more than a mile of beachfront on Lake Michigan and its own astronomy observatory with a huge 20-inch telescope. The campground includes pull-through sites with 30/50-amp power hookups and showers & restrooms. 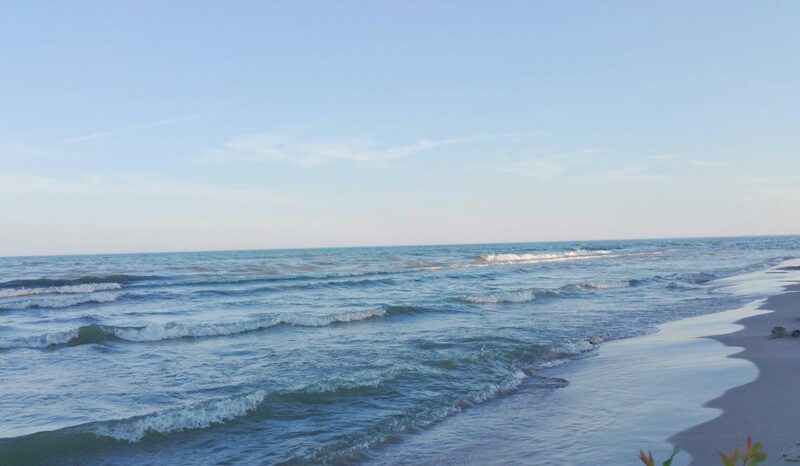 Kohler-Andrae State Park is only 20 minutes north of Harrington Beach with more peaceful lakefront views. The park has hiking paths through the forest, sand dunes, a nature center, and campsites with electric hookups. Shops and restaurants in Sheboygan are only a quick 15-minute drive away. 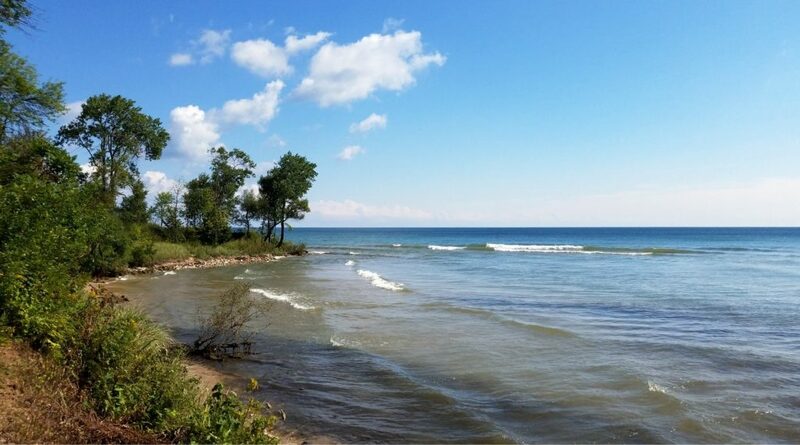 Continue north on the Lake Michigan shoreline in Wisconsin and you’ll reach Point Beach State Forest. 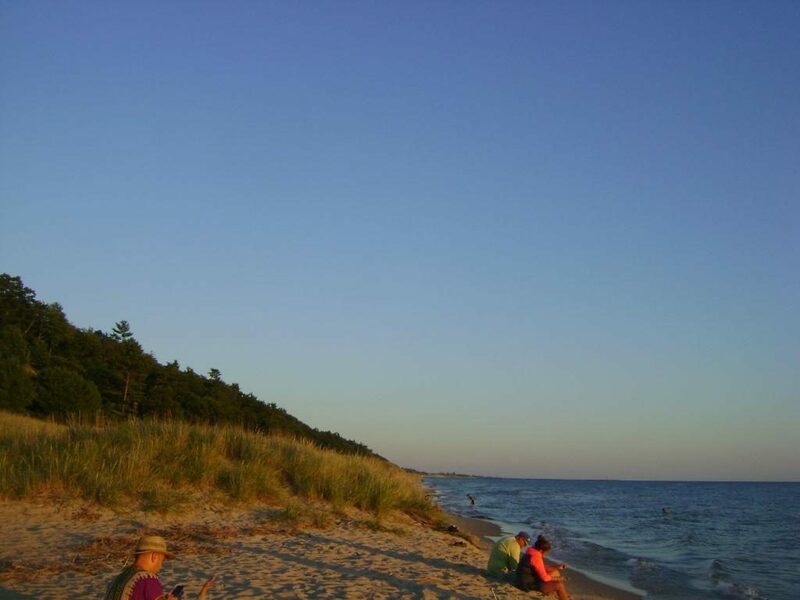 This park has a six-mile-long sandy beach and wooded campsites a short walk from the water. It’s also home to Rawley Point Light, one of the tallest lighthouses on the Great Lakes, and has a separate beach for dogs. 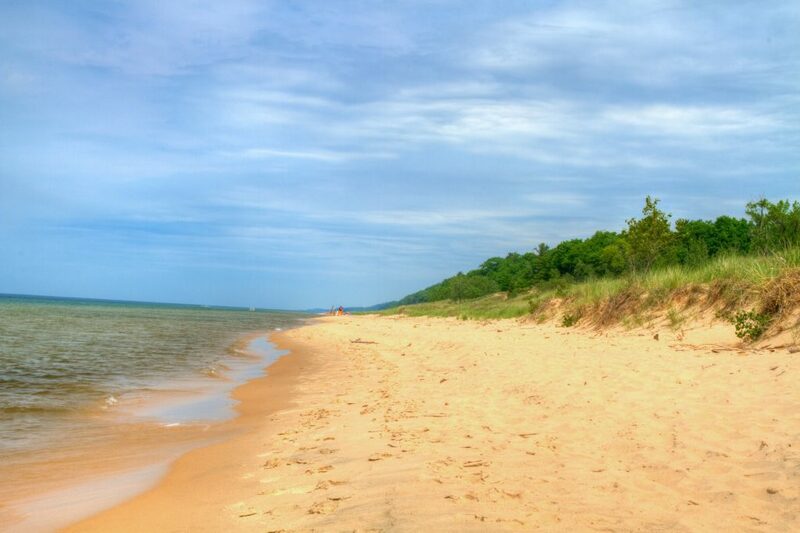 This huge park stretches over 6 ½ miles on Lake Michigan and across 4,160 acres in Illinois. It has large shaded sites with power hookups and lots of trails to hike or ride your bike. The campground has a community water spigot and bathhouses with restrooms. You can drive to Chicago and Milwaukee in less than an hour from here. 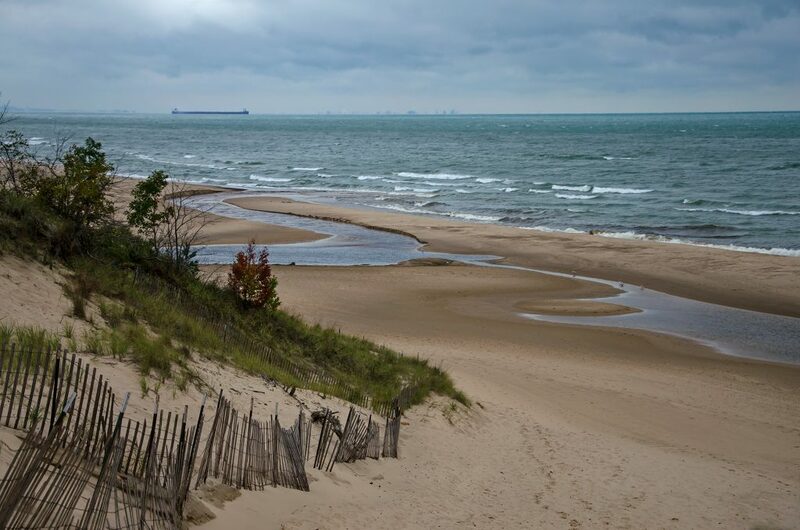 Adjacent to Indiana Dunes National Lakeshore, this state park has beach access and miles of trails that you can hike through the dunes. A stretch of Highway 12 runs through the park and hopping on I-90 westbound will take you to Chicago in less than an hour. The campground has paved roads and long, level sites with 30/50-amp power hookups. 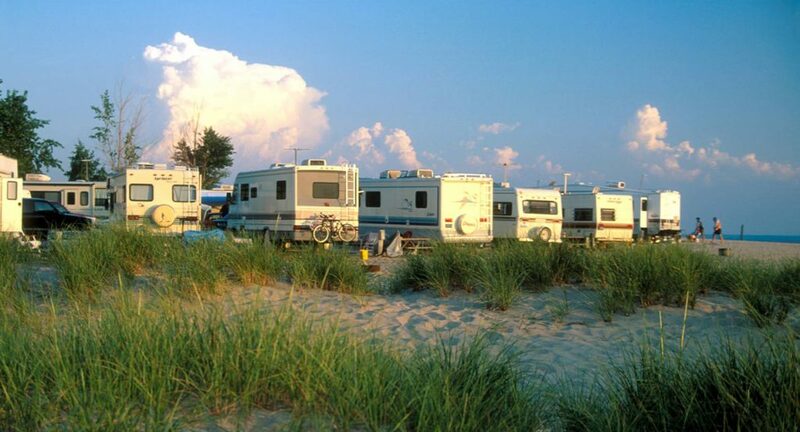 There numerous other campgrounds that come to mind on Lake Michigan. 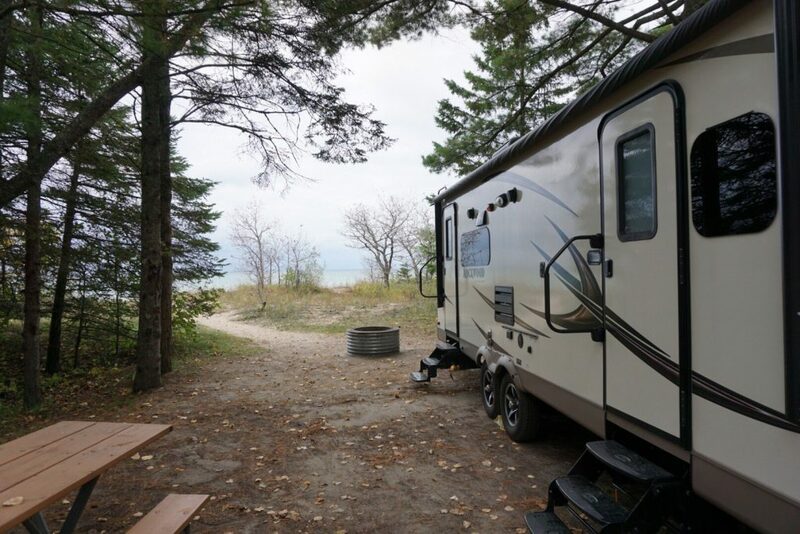 Three campgrounds In the Upper Pennisula between Menomoee and Escanaba MI along Highway 35 are worthy to be on this list for example. Did you visit all these campgrounds listed?